To be honest, Lee’s “reimagining” of the original film isn’t all that imaginative at all – exact shots and entire set-ups from the original film are duplicated – thus prompting you to ask why he bothered to remake it in the first place. I’m going with two out of five for Spike Lee’s disappointing Oldboy. Like our very own Sanjay Gupta’s desi remake Zinda, this one too is all style over any real substance. I’m not sure why Spike Lee’s Oldboy exists. The original film, made by South Korean director Park Chan-wook in 2003, is a cult classic that won the Grand Prix in Cannes. So I’m going with one and a half star and recommending that you enjoy the original Oldboy. The new one is too dated. Lee is known for his bold films, but his remake of Chan-wook Park’s genuinely freaky Oldeuboi lacks the former’s visceral punch. Two scenes – an extended tracking shot of a fight scene involving a hammer and Joe crawling out of a Louis Vuitton trunk in a field while a woman holding a yellow umbrella stands in the background – are surreal. What’s oddest is that at the end of 20 years, Joe looks like he hasn’t even aged 20 days and some of the dialogues are shockingly limp. The film has graphic violence and perversion, but there is no take-away. It leaves you trying to nail down what the point to this remake really was. 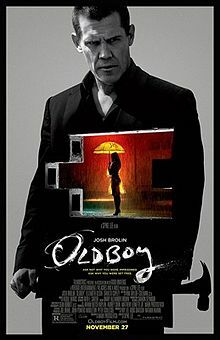 Watching Oldboy feels like you’re watching a history lesson on the projector in your seventh grade class. While the visuals may be dark and slick, there is really nothing about the film that feels even a tiny bit humane. I’m going with half a star for Spike Lee’s Oldboy and that’s only because of Sean Bobbitt (Shame, Byzantium) and his dreamily morbid cinematography. Oldboy is not for the weak-hearted.Or film lovers. Or just people, in general.